Historically ryokans have been around since the eighth century and served the highway between Kyoto and Edo (now called Tokyo) as welcome places of rest for weary travellers. While some ryokans were simply extra rooms in houses (much like the AirBnB set up of today), others were more elaborate and were used by high ranking officials in the government. Japan is well known for its hospitality or ‘omotenashi’ and you’ll be welcomed with open arms and spoiled with attentive service at a ryokan. Why Are Ryokans Beneficial to Your Health? Ryokans today are typically found in the countryside, though you can find urban ryokans in the main cities like Tokyo. They are usually situated to take advantage of their natural surroundings, sometimes they are near a river, afford a view of the mountains or look out onto beautiful gardens. They are weekend retreats for city dwellers, enabling people to relax away from the hustle and bustle and reconnect with nature. Japanese people believe the traditional architecture, lack of clutter, clean lines and unique atmosphere of a ryokan, have many mental and physical health benefits. Ryokan rooms don’t have much furniture, in fact you might find one or two low tables for tea to be served and sitting cushions (zabuton) and that’s about it. Bedding consists of futon or sleeping mattresses which are kept in a closet (oshiire) and only brought out and prepared for sleep at night. Raw wood is a highly dominant feature of ryokans, and usually kept in natural form so the grain can be seen and appreciated. Movable screens with rice paper (shoji) and sliding doors (fusuma) are used to let in natural light whenever needed. 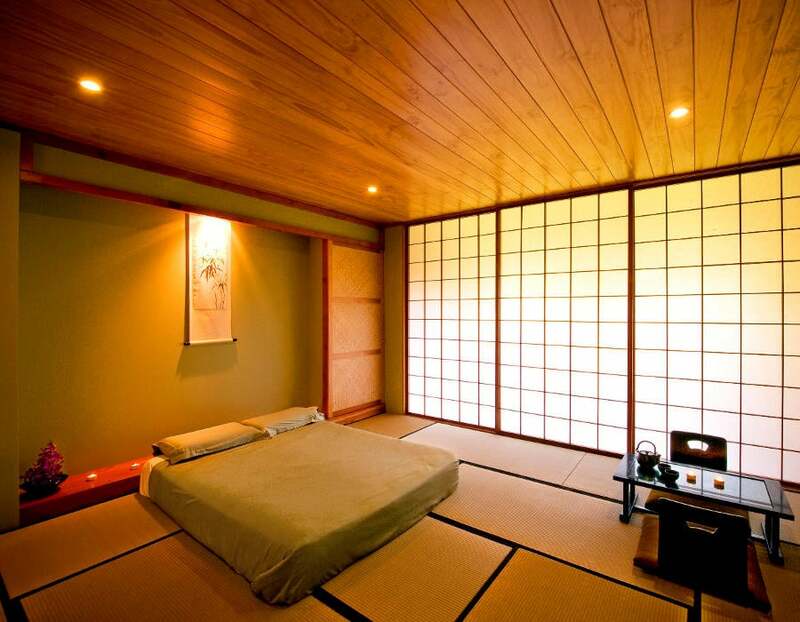 A big feature of Japanese rooms are the tatami mats which line the floor. These are typically made of rice straw and combine with the wood give off a subtle natural scent that define traditional Japanese accommodation. These mats are so integral to the ryokan, for their preservation they must only be walked with socks or your bare feet, not slippers and definitely not outdoor shoes. Hot spring bathing is also an essential part of a relaxing stay at a ryokan, and a private hot tub or outdoor pool with a stunning view can usually be found somewhere on the premises. The Japanese Mountain Retreat offers Dandenong Ranges accommodation that mirrors the experience of staying at a Japanese ryokan. This unique accommodation in Victoria is situated a 45 minute drive from Melbourne and provides all the features you would normally find at a traditional Japanese ryokan, including a breathtaking mountain setting among rocks, waterfalls and bamboo groves. A stay at this 5 star Dandenong Ranges accommodation allows couples to take a short break from the city, either for a day or for a weekend. The five acre landscaped resort has been designed to accommodate just three couples at a time and each traditional style Japanese room has shoji screens, tatami flooring an futon mattresses for sleeping. Each room has its own private deck with a cedar hot tub and an outdoor bathing area away from other guests. During their stay on a one night accommodation package or two night accommodation package, guests are invited to partake in all the things you would normally do at a luxury ryokan in Japan, such as contemplate nature, take quiet strolls, soak in private hot springs, enjoy spa treatments, drink green tea, sleep in a futon bed, and taste amazing food. The accommodation packages offer a range of experiences to suit different budgets. For example, the Destress & Unwind package for two nights includes: an a la carte breakfast each morning, a three course dinner each night, private hot tub bathing and two 60 minute massages. While the Lovers Escape will treat you to: red roses & chocolates, an a la carte breakfast each morning, a three course dinner each night, sparkling wine, private hot tub bathing and a spa treatment package. If you’re searching for Dandenong Ranges accommodation for a memorable romantic anniversary or honeymoon, then the Japanese Mountain Retreat can meet all your requirements at any time of the year. 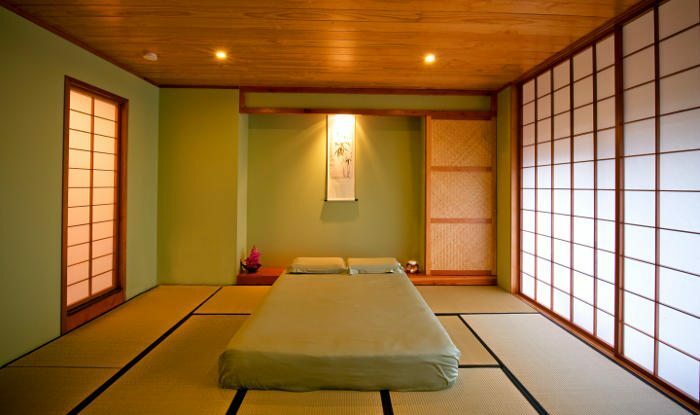 Be sure to book well in advance so you can experience all the delights of a Japanese ryokan right here in Victoria.